This 1 bedroom apartment with swimming pool is located in Capalbio and sleeps 4 people. It has WiFi and air conditioning. The apartment is near a beach. Part of terraced house, 2 - 4 people, 2 room/s, 1 bedroom/s, 1 bathroom/s, approximately 50 m², 1 floor/s, separate access to the property. Feature: Property in a holiday complex (11 building(s) in total, 40 units in total). Furnishing: local standard, pleasant, tiled floor. Equipment: TV; internet access Wi-Fi (included); safe; combined heating/air conditioning. Optional intermediate cleaning (except for the kitchenette) against payment, € 15. Holiday resort tax. Linen/towels available. Change of bed linen every 7 days included. Change of towels every 3-4 days included. Deposit € 200 (in cash). Cot € 7 per day (on order). High chair free of charge (on order). Pet 2 animals allowed, € 5 per pet and day (small pet only; please advise prior to arrival). Estate: approximately 3 ha, closed plot (fence), trees, with plants, lawn. Pool (shared use): 25.0 x 12.0 m, 0.70 - 1.70 m deep, 13/05/19-29/09/19. Pool area: tiled, lawn for sunbathing, sun loungers, sunshades, external shower. Wellness: shared use (free of charge): outdoor whirlpool (approximately mid May until mid September). Sports facilities/ leisure time: shared use (free of charge): tennis, multi-purpose sports track, table football, table tennis table, children's playground (depending on availability). Shared use (payment): horse-back riding, mountain bikes (depending on availability). Day care: included: animation for children, children's club (approximately June to September). Infrastructure: around-the-clock reception service; washing machine (shared use, payment). Restaurant, snack bar, shuttle service; breakfast, half board, full board: payment and request on-site. Plot description: terrace 30 m² (roofed), furnishing provided. The apartment is described as good value for money. 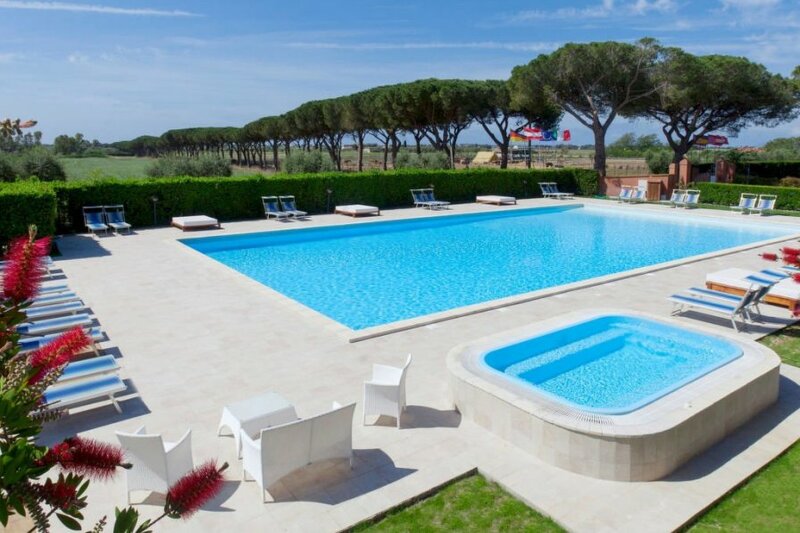 It has a swimming pool and is located in Capalbio. The nearest airport is 116km away. It is set in a convenient location, just 0 metres away from a beach and 7km away from the city center. The apartment has free wireless internet. The apartment is adequately equipped: it has air conditioning and a washing machine. It also has a tennis court.